Abdelrahman, A. M., Al Suleimani, Y., Shalaby, A., Ashique, M., Manoj, P., Nemmar, A., & Ali, B. H. (2019). Effect of canagliflozin, a sodium glucose co-transporter 2 inhibitor, on cisplatin-induced nephrotoxicity in mice. Naunyn-Schmiedeberg's Archives of Pharmacology, 392(1), 45-53. Hammad, F. T., Salam, S. A., Nemmar, A., Ali, M., & Lubbad, L. (2019). 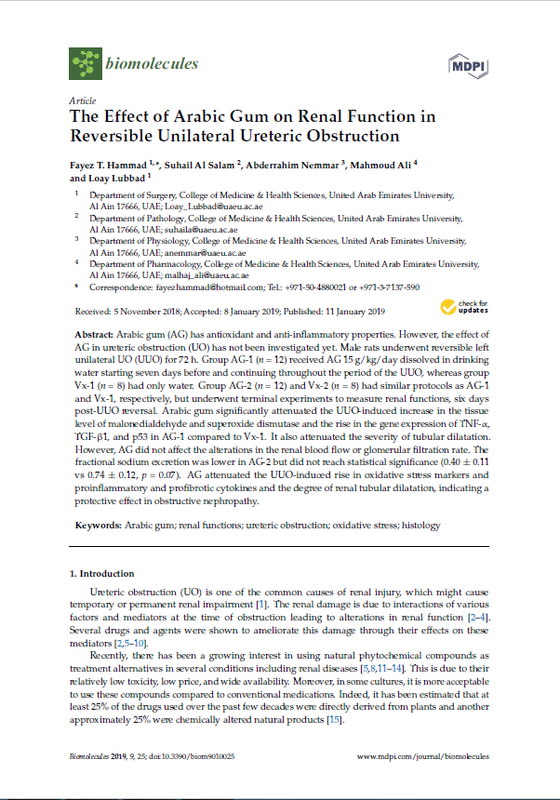 The Effect of Arabic Gum on Renal Function in Reversible Unilateral Ureteric Obstruction. Biomolecules, 9(1). Abu-Zidan, F. M., & Cevik, A. A. (2019). Kunafa knife and play dough is an efficient and cheap simulator to teach diagnostic Point-of-Care Ultrasound (POCUS). World Journal of Emergency Surgery, 14(1). Aburawi, E. H., Hamad, S. A., Yasin, J., Almekhaini, L. A., & Souid, A. K. (2019). Dyslipidemia, subclinical inflammation, hepatic cholestasis and endothelial dysfunction in schoolchildren with excess fat: A study from the United Arab Emirates. PLoS ONE, 14(1). Gebreyohannes, E. A., Bhagavathula, A. S., Abebe, T. B., Seid, M. A., & Haile, K. T. (2019). In-Hospital Mortality among Ischemic Stroke Patients in Gondar University Hospital: A Retrospective Cohort Study. Stroke Research and Treatment, 2019. Al-Ali, M. A., Hefny, A. F., & Abu-Zidan, F. M. (2019). Head, face and neck camel-related injuries: Biomechanics and severity. Injury, 50(1), 210-214. Patil, A. S., Singh, A. D., Mahajan, U. B., Patil, C. R., Ojha, S., & Goyal, S. N. (2019). Protective effect of omeprazole and lansoprazole on β-receptor stimulated myocardial infarction in Wistar rats. Molecular and Cellular Biochemistry. Aagaard, K. E., Randeblad, P., Abu-Zidan, F. M., & Lunsjö, K. (2019). Return to work after early repair of acute traumatic rotator cuff tears. European Journal of Trauma and Emergency Surgery. Kunhivalappil, F. T., Hefny, A. F., & Abu-Zidan, F. M. (2019). Management of blunt adrenal gland injury in a community-based hospital. Injury. Zaabi, N. A., Kendi, A., Al-Jasmi, F., Takashima, S., Shimozawa, N., & Al-Dirbashi, O. Y. (2019). Atypical PEX16 peroxisome biogenesis disorder with mild biochemical disruptions and long survival. Brain and Development, 41(1), 57-65. Dibattista, A., McIntosh, N., Lamoureux, M., Al-Dirbashi, O. Y., Chakraborty, P., & Britz-Mckibbin, P. (2019). Metabolic Signatures of Cystic Fibrosis Identified in Dried Blood Spots for Newborn Screening Without Carrier Identification. Journal of Proteome Research. Pampalakis, G., Mitropoulos, K., Xeromerisiou, G., Dardiotis, E., Deretzi, G., Anagnostouli, M., . . . Patrinos, G. P. (2019). 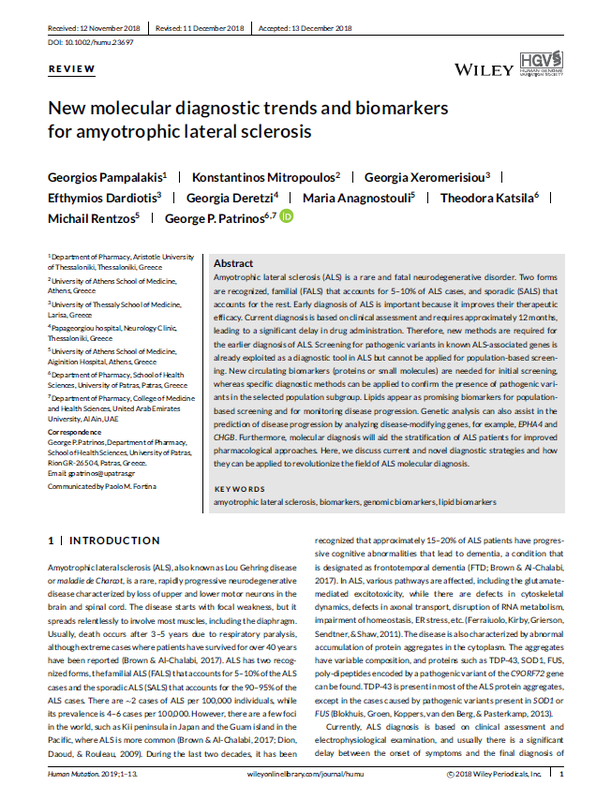 New molecular diagnostic trends and biomarkers for amyotrophic lateral sclerosis. Human Mutation. Fragoulakis, V., Bartsakoulia, M., Díaz-Villamarín, X., Chalikiopoulou, K., Kehagia, K., Ramos, J. G. S Mitropoulou, C. (2019). Cost-effectiveness analysis of pharmacogenomics-guided clopidogrel treatment in Spanish patients undergoing percutaneous coronary intervention. 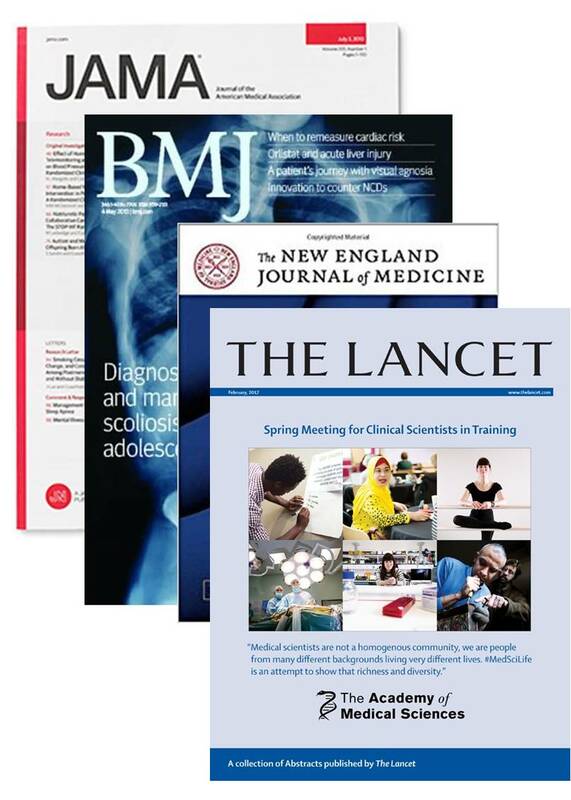 Pharmacogenomics Journal. Miyazawa, K., Li, Y. G., Rashed, W. A., Al Mahmeed, W., Shehab, A., Zubaid, M., & Lip, G. Y. H. (2019). Secondary stroke prevention and guideline adherent antithrombotic treatment in patients with atrial fibrillation: Insights from the Gulf Survey of atrial fibrillation events (Gulf SAFE). International Journal of Cardiology, 274, 126-131.